Members of the Wings of Blue United States Air Force Parachute Team practiced jumping at Wright-Patterson Air Force Base Friday afternoon in anticipation of jumping again later in the day as part of the Freedom’s Call Tattoo festivities. 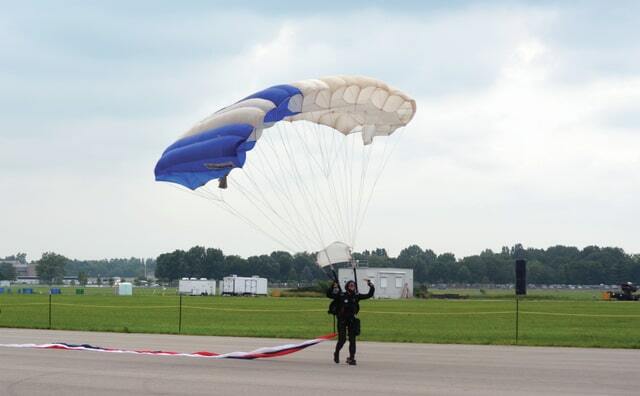 WRIGHT-PATTERSON AIR FORCE BASE — Members of the Wings of Blue United States Air Force Parachute Team practiced jumping at Wright-Patterson Air Force Base Friday afternoon in anticipation of jumping during Friday’s Freedom’s Call Tattoo festivities. Their jump did not happen however as the event was cancelled due to poor weather shortly before the gates were to open and the threat of more storms later. The event will not be rescheduled. Tattoo was also cancelled in 2012 when a derecho — a widespread, long-lived, straight-line wind storm — tore through the midwest. A stage nearly collapsed and 19 people were injured.